Your clients look to you to be the expert, to help them drive more foot traffic to their businesses. This isn’t always the easiest path to navigate. 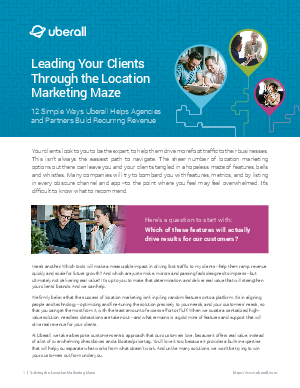 The sheer number of location marketing options out there can leave you and your clients tangled in a hopeless maze of features, bells and whistles. Many companies will try to bombard you with features, metrics, and by listing in every obscure channel and app—to the point where you feel may feel overwhelmed. It’s difficult to know what to recommend. This guide can help.